Also serving communities of Marshall. There are 20 Assisted Living Facilities in the Sun Prairie area, with 6 in Sun Prairie and 14 nearby. The average cost of assisted living in Sun Prairie is $3,585 per month. This is higher than the national median of $3,346. To help you with your search, browse the 48 reviews below for assisted living facilities in Sun Prairie. On average, consumers rate assisted living in Sun Prairie 4.2 out of 5 stars. Better rated regions include Waunakee with an average rating of 4.4 out of 5 stars. Caring.com has helped thousands of families find high-quality senior care. To speak with one of our Family Advisors about assisted living options and costs in Sun Prairie, call (855) 863-8283. Sun Prairie is a vibrant city 12 miles northeast of Madison and 66 miles west of Milwaukee with a growing population, of whom 11 percent are seniors 65 and over. This senior population is served by six assisted living facilities (ALFs) within city limits, all licensed by the Wisconsin Department of Health and Family Services and defined as Community Based Residential Facilities (CBRFs) that provide room and board to five or more residents requiring care below the intermediate nursing level. Sun Prairie is a slightly cheaper alternative to living in Madison with an average cost of living nine percent higher than the U.S. median. Health care costs are a bit higher here, gaining a score of 122 compared to the U.S. average of 100. Grocery and transportation costs fare better and are just about even with national averages. 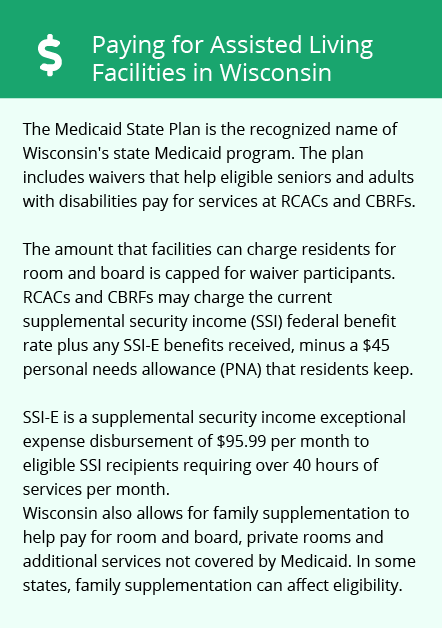 Seniors in Sun Prairie won’t have their social security benefits taxed as Wisconsin is considered a retirement tax friendly state. Pensions are also not taxed, which leaves seniors more money in their budget to put towards assisted living. Winters in Sun Prairie can be quite cold with temperatures in January dropping at times to ten degrees Fahrenheit. The city gets approximately 44 inches of snow per year, above the U.S. average of 26. Summers are more mild with average temperatures reaching around 82 degrees in July. Both violent and property crimes are lower than U.S. averages in Sun Prairie, coming in at 28 and 35.6 out of 100 respectively. The national medians are 31.1 and 38.1. The city is safer than 37 percent of U.S. cities in general. Seniors who do not drive may find it difficult to get around town as there are no public buses. However, Sun Prairie Taxi does offer a shared-ride taxi with a reduced fare program for income eligible seniors. Seniors will have plenty to do in Sun Prairie with several local parks and golf clubs, the Historical Library & Museum and Angell Park Speedway. The Colonial Club, Sun Prairie’s senior activity center, also affords seniors opportunities for day trips to festivals, shopping, boat rides and concerts. Assisted Living costs in Sun Prairie start around $3,585 per month on average, while the nationwide average cost of assisted living is $4,000 per month, according to the latest figures from Genworth’s Cost of Care Survey. It’s important to note that assisted living rates in Sun Prairie and the surrounding suburbs can vary widely based on factors such as location, the level of care needed, apartment size and the types of amenities offered at each community. 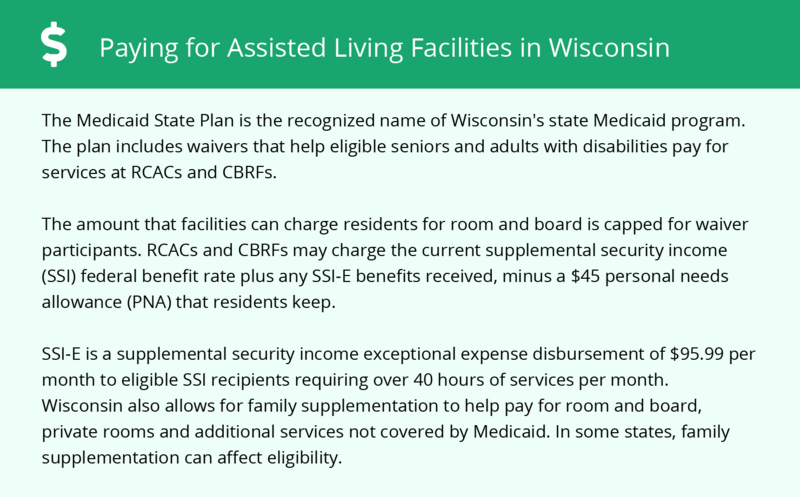 Seniors in Sun Prairie may apply for financial assistance for assisted living through the Wisconsin Department of Health Services’ Family Care program which helps to cover costs for seniors who live in a small facility with 20 beds or fewer. Seniors in a larger facility can apply for PACE to help offset costs associated with assisted living. Sun Prairie and the surrounding area are home to numerous government agencies and non-profit organizations offering help for seniors searching for or currently residing in an assisted living community. These organizations can also provide assistance in a number of other eldercare services such as geriatric care management, elder law advice, estate planning, finding home care and health and wellness programs. To see a list of free assisted living resources in Sun Prairie, please visit our Assisted Living in Wisconsin page. Sun Prairie-area assisted living communities must adhere to the comprehensive set of state laws and regulations that all assisted living communities in Wisconsin are required to follow. Visit our Assisted Living in Wisconsin page for more information about these laws.